Cyber threats are growing faster than any other category of business risk, breaches are inevitable, and the areas put at risk when they happen are broad and deep: from a compromised system or supply chain to the financial implications of non-compliance and breach notification. You not only face compromised or lost data, but your brand will take a huge hit that it may not recover from. Add to that the legal risks resulting from regulatory fines and failure to keep customer commitments, and it adds up to a game-changing argument. Business leaders need to understand the potential losses they face on multiple levels, acknowledge the changing risk and have a breach response plan in place, but most importantly they must escalate cyber risk at the highest organisational levels and bridge the gap between the fight on the frontlines and priorities in the boardroom. 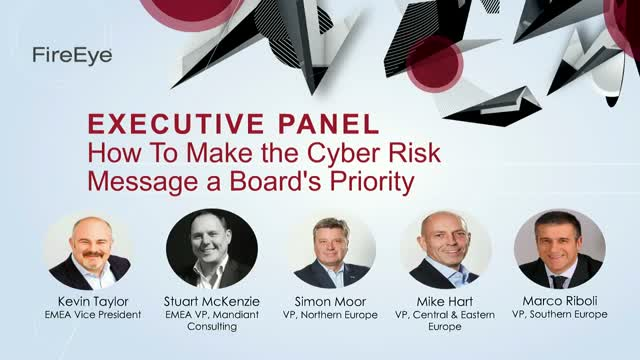 Join us for an executive panel with our EMEA VP & regional leaders as they discuss insights on how the CISOs take the risk message to the board and how they bridge the gap by translating technical jargon into business language. "Cyber security is a constant battle for every business, and one of the challenges is getting the Board of Directors to understand that enterprise-wide risk management is more than an IT problem. FireEye helps security teams and company executives bridge the gap between the fight on the frontlines and priorities in the boardroom." "Cybersecurity is now a persistent business risk. The impact has extended to the C-suite and boardroom.